Welcome to Adventure Sports in Hershey, a family entertainment center located within minutes of the major Hershey attractions. Located on ten acres of beautiful countryside, the flowers, waterfalls, and covered decks offer a respite from work and school. The park offers great entertainment for the whole family and features go-karts, miniature golf, bumper boats, batting cages, video arcade and snack area. A short distance away, Adventure Sports in Hershey has a twenty acre, lighted driving range with twenty four practice stations, as well as a sand and chipping area. A golf instructor is available by appointment. Adventure Sports in Hershey is a family owned and operated business that opened in 1990. 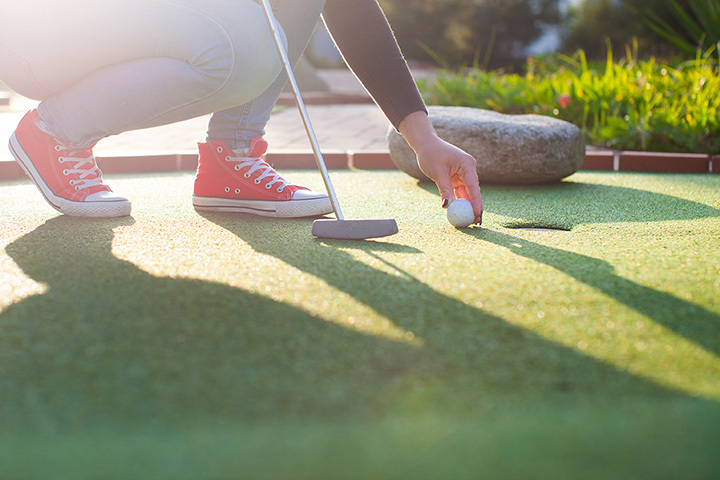 It started with the construction of the miniature golf course. A quote from the movie Field of Dreams, “build it and they will come”, became the mantra during construction. Sure enough, on June 22, 1990, Adventure Sports opened its doors and local residents as well as tourists have been enjoying it ever since. In 1991, a baseball/softball batting range with lights was added. 1993 featured the construction of the go-kart track. The experience of the guests was enhanced again in 1994 when a 4,000 square foot video arcade was built. The next few years saw continued development as Adventure Sports added bumper boats and the golf driving range. The Adventure Sports season starts the beginning of April (sometimes the end of March if the weather allows) and continues until the last weekend in October. Adventure Sports is proud to celebrate over twenty years of providing affordable family fun. Our reasonable prices, cleanliness and friendly staff all contribute to an entertaining visit in the Hershey area.